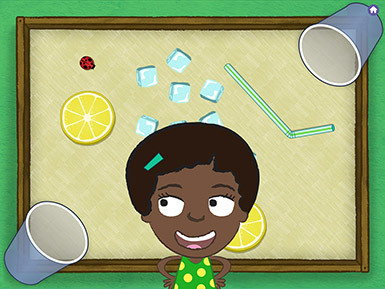 In Lemonade Stand, children pick up and tilt the iPad to slide the same number of ice cubes into each customer's cup. Watch out! Holes on the sides of the table can cause ice cubes to fall off and get grassy, and ladybugs try to sneak their way into the cups! After sharing the ice cubes equally, children pour and drink lemonade with Gracie and her friends. Mmm! Delicious! This game provides a fun way for children to equipartition. Equipartitioning is dividing a collection of objects into equal groups or a continuous whole into equal parts. It is an important skill that helps build children's understanding of fractions, ratios, division, multiplication, number sense, and number composition. 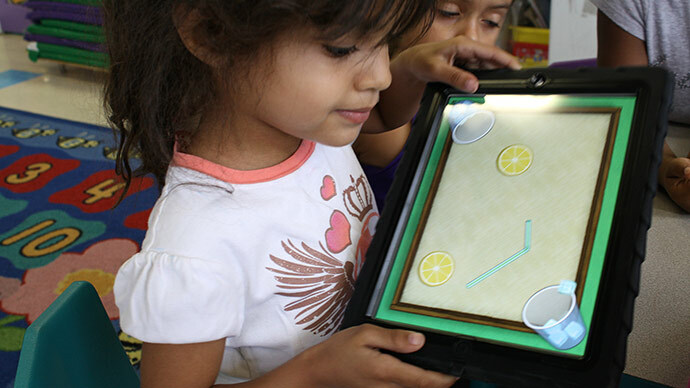 Lemonade Stand is part of the four-game equipartitioning suite from Early Math with Gracie & Friends, a first-of-its-kind mobile app brand based in early learning sciences, rigorously researched and developed specifically for preschool classroom use. A randomized control trial demonstrated significant learning gains in children who used the Early Math with Gracie & Friends apps.